Tom Collins' Gasifier - Projects - Drive On Wood! No reprimands from me; I have way to much respect for you words. Your are absolutely correct about everything you posted. I “knew” I should be back blowing to dry things out, but when I tried it I didn’t get a rush of smoke coming out of the lid and I was concerned that I wasn’t moving enough air. Pulling down on the draft did give me that roaring sound down in the belly, so I though more was happening. I will not do that again, because I didn’t run any petro through the engine before shut down and I am very fearful of what is going to happen to my accelerator pedal today. I have rebuilt two V6’s for broken push rods in my early woodgas attempts. And yes you are correct about mounting the grate. I do have it mounted so that I can reach up and turn it a quarter turn and it will drop down. I did NOT make an ash pit opening large enough to take the grate out. A word to WG’ers— Max has many very good ideas, that if followed will improve your gasifier. On the other hand he can be short on explanations and he does not like to repeat himself so you have to really study what he says and accept that in the end there IS a reason for his recommendations. PS. I may have to wait for a day or so to get some wood cut up and dried. I have had to go back to using the table saw which is slower and messier than the old chunker was. I hope there is very little wood above the nozzles now. In any case, do not add more than to a level ~4" above the nozzles, so you can “half-char” that amount with up-blow first. When this little amount is well chared by up-blow, you have a chance to “hot-blast” the lower wet char all the way to the grate. can you fill the hopper! When the up-blow gases will ignite with only a spark, you are near to have prepared the “upper” char. Be carefull, not to burn your face when igniting the up-blowing gases! Face below the hopper opening (outside) when sparking! It was MaxG who taught me first about striker-spark testing only. Exactly how the IC gasoline engine will. NOT flame-ignition testing. “Flame” ignition systems went out in the 1870’s. And it was MaxG taught me to use wooden poker rods to save delicate internals. The world is full of green-limb-sticks. NOT flame-ignition testing. “Flame” ignition systems went out in the 1870’s. I watched Vesa Mikonens (or however you spell his name) startup video some time back and I remember he had some kind of oil wick flame under his flare on his trailer gasifier so it seems like some still use flame. I have found out though that if a spark will light the gas - then you have good gas. “Flame” ignition systems went out in the 1870’s. Ok Max; I paid to much attention to the up blowing process and not enough what to do after that. It took a long time but I just kept the up draft going and going. First very little smoke, then more and more. Then the smoke stopped. I thought possibly the flame had broken through the top of the wood in the hopper and was burning the smoke. I carefully looked inside and yes, there was a small flame coming out of the center of the wood chunks. I took a paddle I had and scrapped the wood that was built up along the wall of the hopper down in to a mound in the center covering the flame. The smoke came back gray at first but very quickly turned to that grungy brown. I was about to try a spark test, when the entire filler opening erupted into flames. I closed the lid to stop the fire but it was blowing out from under the lid until I shut the Kirby off. After coming in the house and reading your instruction again, I realize you said to turn the air around and pull some flames down to the grate. It was some time before I re-read your instructions and I had locked the lid down and close all the valves so the hopper would not continue to burn. Tomorrow, I will heap the wood up again in the center ( if there is enough remaining) and start the fire again with a little up draft until I get the brown smoke again, then pull a little down to the grate, and then feed some new chunks into it. Hopefully another ride. Darn, I just did another search. There was such a thing. Yes, and a very cool engine ignition system at that, seems to work quite well for low rpms. Flying piston machine = the power is generated by vacuum! pressure performes “the work” on the engaged downstroke. it has to be carried out from A to O . Half ways = no ways, sometimes worse. I am a “flimsy” type myself, so experience is speaking. but let them burn until the flames are clean (tarfree). Then, the motor should start without ANY gasoline merrily and happily. Not before that any new bunkering. if the upblowing happens via the nozzles, or from below the grate! That is not a very happy circumstance. and consumes char below the nozzles. On the other hand it is cleaning the “end process” char. No chance to blow the nozzles independently? Hey Tom how do you run that kirby backwards? DonM often times the continuous flame lighters in starting up gasses stacks are to burn off visible stinky smokes for public acceptance of woodgasing. APL/Jim Mason in the Cal. Berkley/SF Bay airshed region later-on shows using continuous propane flames to clean burn starting gasses and keep complaint until the system could be fully all through an IC engine combustion/cleaned. A way to make no-visible smoke that can be complained about. 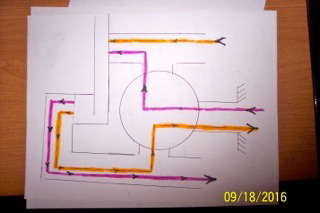 Don: Here is a rather bad drawing of how I reverse the flow from my Kirby. Along with the picture you will get the idea. It is all based on a three-way valve. also fills all the coolertubes and pipes, and filterbarrel toward the motor with AIR! “new gas” through the cooler and the lower part? of your filter barrel. The upper part of the filter keeps “fresh air” a long time, as it is not (seemingly) blown through by anything else than backward leaking fresh air from the motor! As it seems now, it gives a full reason for very long startings. will spare a lot of brute work along the rest of the system. When reorganising the system flows, the startup dirty gas should be blown out as straight as possible; passing no more components than necessary = the cyclone for safety reasons. Pushing fresh air direct to the nozzles gives the choise to blow upward or downward for obvious needs. A “fireing up” box can be attatched in front of the nozzle-entrance for using spirit, white spirit, kerosene, etc to start up the fire. Or buthane, propane. Initially with “soft air-blowing”. Also an electrical glow-plug can be used; making the starting procedure completly hands-off and weather independent. The glow plug is then placed at the fringe of the char abowe or below the restriction. Good morning Max ( or evening which ever the case is for you. ); Well I am ready for a fresh start. I have burned up all the old wood. I did through in some new wood to try to get it going but then the battery went dead on the truck starter. Ok the plan will be to start from ground zero. I have plenty of charcoal left over from the fire. It got hosed down but has had several months to dry out. Clear out everything even if some is left in the reduction zone ( will try dropping the grate to empty it. Wouldn’t it have been nice if I had made an ash door where I could work with the grate better:thinking:) Then fill up to a little over the nozzles with fresh charcoal, then throw in some fresh wood chunks. Now another mistake I made was not “clocking” the fire tube , nozzles with the air manifold inlet. So the best way to ignite the gasifier is poke a whole through the new chunks and light the char from the top. WK style. With my set-up, I am thinking you are saying to blow downward from the nozzles, I should pull a vacuum on the ash pit ( grate, reduction zone, through the nozzles ) and close the hopper lid. Then to blow upward I should put pressure on the ash pit and open the hopper lid to blow straight up or should I leave the hopper lid closed so I blow back through the nozzles? No glow plug for now. Need to work with what I have. It ran a couple of times as it is so I should be able to get it going again. I need to cut some chunks before I can try again. The weather is beautiful for drying some chunks but my wife says it is also beautiful for me to mow the lawn. Guess the wood truck will be put on the back burner for today. lay-out system. With blower pushing clean air only ! I hope the “bottom char” is dried up and tar-free enough! Hard to out-live the grass!